Het is tegenstrijdig om te vasten, maar vervolgens niet te bidden. We hopen met het vasten op Allah’s tevredenheid en vergiffenis, maar we zijn Hem ongehoorzaam in één van Zijn grootste geboden?! We gehoorzamen Allah in het laten van onze geliefde eten en drinken, maar vervolgens zijn we laks in het gehoorzamen van Allah in het verrichten van de vijf verplichte gebeden, welke belangrijker zijn dan het vasten. Het gebed is zo belangrijk dat het nooit komt te vervallen, zolang het verstand aanwezig is. Zelfs degene die zo ernstig verlamd is dat hij geen enkel lichaamsdeel kan bewegen, dient het gebed met de intentie te verrichten. Het gebed was het laatste advies van onze profeet vrede zij met hem aan de moslimgemeenschap toen hij op zijn sterfbed lag. Hij bleef het advies tot het gebed herhalen totdat het hem te zwaar werd. Weet dat Allah ons heeft bevoordeeld met dit gebed. Dit gebed waarmee wij dagelijks onze band met Hem onderhouden, waar wij onze rust uit putten en dat onze steun is in moeilijke tijden. Het is een feit dat degene die niet bidt, weinig zal genieten van deze gezegende maand en haar vele verdiensten. Het is gezellig om met familie en vrienden iedere avond samen het vasten te verbreken, maar is de gelovige niet uit op meer? De eerste vreugde is omdat de vastende blij is dat hij de vastende dag heeft afgerond en weer mag eten. Deze vreugde ervaren alle vastende moslims. De tweede vreugde is wanneer de gelovige zijn Heer ontmoet en ziet wat zijn grote beloning is. Israeli Occupation Forces (IOF) on Tuesday shot and killed a Palestinian east of al-Bureij refugee camp in the central Gaza Strip, raising the death toll to 63 since Monday. The PIC reporter quoted medical sources as affirming that the 51-year-old Ahmad Gharab, from Nuseirat refugee camp, was killed Tuesday afternoon. 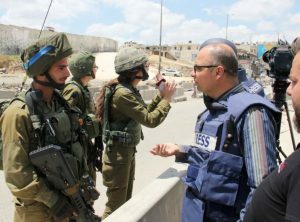 Two others have sustained injuries after being hit by Israeli gunfire. More Palestinian protests have gathered along Gaza border on Tuesday, which marks the 70th anniversary of Nakba. Since the rallies began on March 30, more than 116 Palestinian demonstrators have been killed and hundreds injured by cross-border Israeli gunfire, according to the Palestinian Health Ministry. The Shin Bet, Israel’s internal intelligence, on Tuesday handed pro-Aqsa activist Hanadi al-Halawani an order banning her presence in the Old City of Jerusalem for three months. 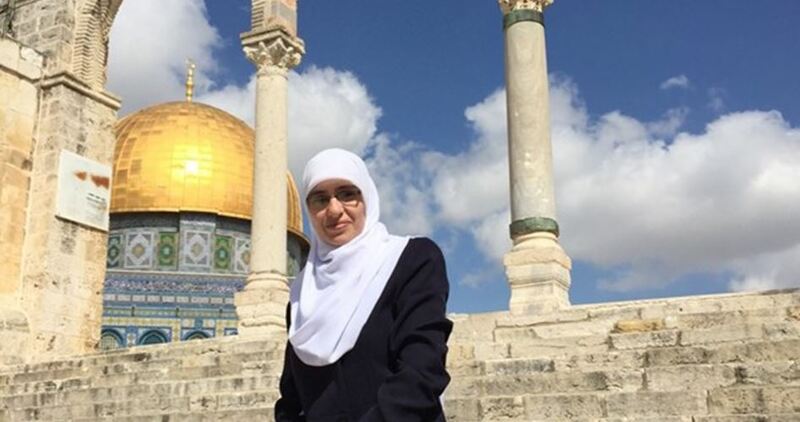 Last Sunday, Halawani, who works as a teacher at the Aqsa Mosque, completed a ban issued by the Shin Bet on her entry to the Islamic holy site for six months. Meanwhile, the Shin Bet also summoned member of Fatah’s revolutionary council Adnan Ghaith for interrogation once again. He was just released after four days in detention. Two Jerusalemite activists called Adel Abu Zunaid and Fuaad al-Sharbati were also summoned for interrogation by the Shin Bet. 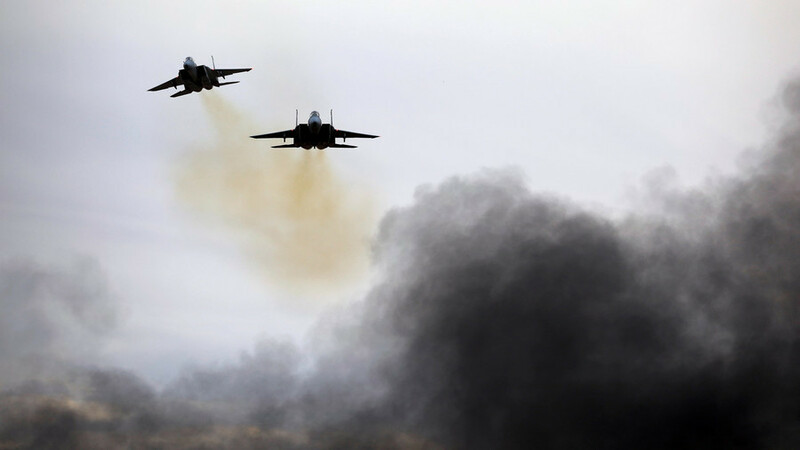 Israel has launched airstrikes targeting Hamas in Gaza as over 50 protesters have been killed at the border by the IDF. It said it was responding to terrorist activity and killed at least three terrorists. It explained that the strike was carried out “in response to the violent acts carried out by Hamas over the last few hours along the security fence.” The previous tweet included a low-quality video appearing to show people running to a fence. A tank approaches on the other side and fires, causing the bodies to run. The video cuts to a number of different clips over its 48-second duration. Earlier in the day, it tweeted that three “terrorists attempted to place an explosive device near the security fence in Rafah,” and that “the IDF fired at the terrorists, who were killed.” This tweet also included a 15-second video containing a number of different scenes edited together, showing smoke and fire at the protests. The sixth week of the Great Return March at the Gaza border has been the most deadly, with the IDF killing 55 Palestinians and wounding more than 2,700 others. Israel has insisted that the protests were a cover for Hamas to attack Israel since before they began. 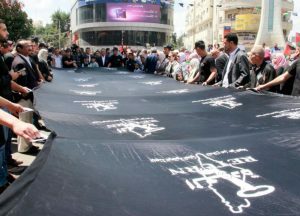 The Great Return March calls for Palestinian refugees to be granted their right to return to the land they fled during the establishment of the state of Israel in 1948. The Palestinian Health Ministry has reported, on Tuesday morning, that a child died from serious wounds he suffered, Monday, after Israeli soldiers shot him east of Gaza City. 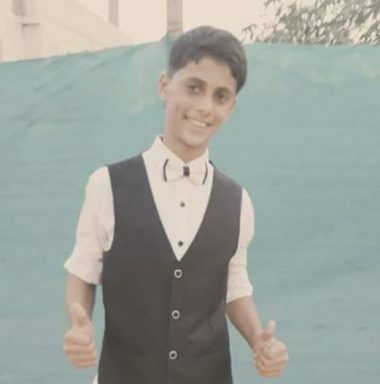 The Ministry said the child, Adel Ibrahim Matar, 16, was shot with live fire, east of Gaza city, and remained in a critical condition at the Shifa Hospital in Gaza, until he succumbed to his serious wounds. Also on Tuesday morning, a man identified as Omar Abu Fol, 30, died from serious wounds he suffered, Monday, after Israeli soldiers shot him, east of Gaza City. Their deaths bring the number of Palestinians who were killed by Israeli army fire to sixty-one since Monday, including an infant, only eight months of age, identified as Laila Anwar al-Ghandour. 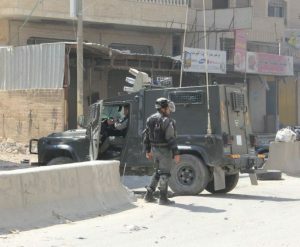 In the occupied West Bank, the soldiers invaded the al-Lubban ash-Sharqiya village, south of Nablus, shot a child with rubber-coated steel bullets, and abducted a young man, identified as Mohammad Nubani, 23. 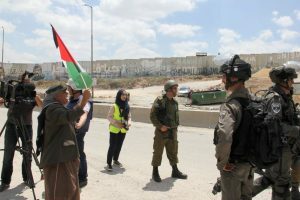 The soldiers isolated the village, preventing the Palestinians from entering or leaving it, and assaulted dozens of protesters marking the Palestinian Nakba, and protesting the illegal U.S. policies, especially opening its new embassy in occupied Jerusalem. 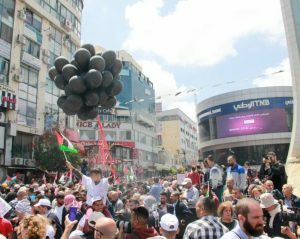 Thousand of Palestinians marched, Monday, from Martyr Yasser Arafat Square in the central West Bank city of Ramallah, and headed towards Qalandia terminal, north of Jerusalem. The protesters marched while carrying Palestinian flags, and signs affirming their legitimate, internationally guaranteed rights of Freedom, independence and the Right of Return to all refugees. 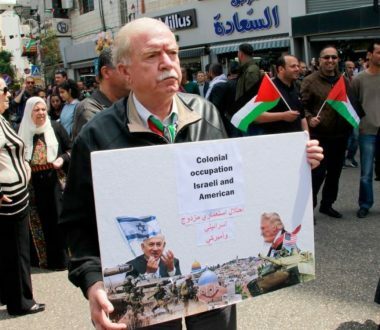 The also chanted against the illegal U.S. policies supporting and financing this illegal occupation, and the transfer of the U.S. Embassy to the occupied city, in direct violation of International Law. 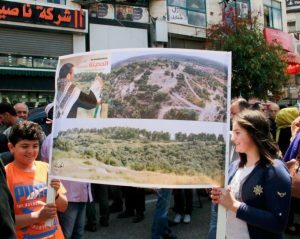 Ramallah Governor Laila Ghannam, said the Palestinians will continue their struggle for liberation and independence, until the establishment of their state with Jerusalem as its capital. In related news, the soldiers injured, on Monday at night, many Palestinians in the al-Fawwar refugee camp, south of Hebron, in the southern part of the occupied West Bank. The Palestinians are marking the 70th anniversary of Nakba Daywhen Israel was created in the historic land of Palestine in 1948. It is worth mentioning that the soldiers have killed, Monday, 58 Palestinians, including six children and four officers of the Palestinian Ministry of Interior and National Security, in the Gaza Strip, and injured 2771. During the Nakba of 1948, prior to the establishment of Israel is the historic land of Palestine, 1.4 million Palestinians lived in 1,300 towns and villages all over historical Palestine. More than 800,000 of the population were driven out of their homeland to the West Bank and Gaza Strip, neighboring Arab countries, and other countries of the world. Israel will assassinate Hamas’ leaders if the security situation on its border with Gaza continues to deteriorate, Egypt warned on Sunday. Delivering a message from Israeli authorities, Egypt’s intelligence agency warned Hamas’ leaders that any deterioration in the situation on the Gaza border could lead to its leaders being targeted. Sources said that Egyptian authorities received several messages from Israel urging the former to intervene promptly to deter Hamas and other Palestinian factions from intensifying protests along the Gaza-Israel border. Nearly 60 Palestinians were killed by occupation forces yesterday as they demonstrated near the border. As a result of Israel’s heavy-handed response to the unarmed protesters, South Africa and Turkey recalled their envoys to Israel. Palestine and Jerusalem are Arab and Islamic and we will never waive an inch of their soil, Muslim Brotherhood spokesperson, Talaat Fahmi, said yesterday. “Palestine will remain an Arab and Islamic country, and we won’t give up on any inch of its soil,” Fahmi said in an official statement. He hailed the Palestinians’ Great March of Return which called for mass protests along the Palestinian-Israeli border to support the rights of the Palestinian people. According to the Palestinian health ministry, nearly 100 Palestinians have been killed as a result of Israel’s use of live ammunition, while nearly 5,000 have been injured. The protests are due to culminate today as Palestinians commemorate Nakba Day, when nearly one million were forced out of their homes to make way for the formation of the state of Israel in 1948. Israel frequently claims its ‘right’ to exist. In fact, states do not exist by right and neither do they have a right to exist. They continue to exist because they have a strong army, capable of taking land and imposing their rule on the native population. They exist because they have the support of their people, even, eventually, those they have conquered. They exist because they rule with the consent of the people, as represented in consultation and democratic forms of government. They exist because they get on well with their neighbors. They exist because they form strong alliances with countries more powerful than themselves and because, globally, they form a community of nations committed to the rules that govern them all. This does not mean that they do not break them, because they often do, but they do not live in their permanent breach. As for its neighbors, Israel has diplomatic relations with two, Egypt and Jordan. The ‘peace’ between them is better described as a state of no war, given the popular animosity to Israel in both countries. The theocratic anti-democratic monarchies of the Gulf, Saudi Arabia, Qatar, the UAE, and Bahrain have responded to Israel’s efforts to open relations with more Arab countries but none of these governments can be said to represent the wishes of the people. States have risen and fallen since the beginning of recorded history. They fade out of history or they emerge in new forms. Nazi Germany gave way to democratic Germany. The regional principalities of Italy were combined in one nation-state. The apartheid state of South Africa was finally replaced by a democratic state. Colonial-settler states have even less right than other states to claim a ‘right’ to exist. They destroyed the right of others to exist as they had existed, in some cases for tens of thousands of years. The white settlers in North America destroyed native cultures. So did the white settlers in Australia. What right do they have to claim a ‘right’ to exist? Israel is a particular case. It was an anomaly from the start, a settler-state established not at the height of imperialism but at a time of decolonization and self-determination. The very organization which upheld these principles in its foundation documents, the United Nations, broke them in the case of Israel. There was no democratic vote on the future of Palestine. The vote in favor of partition squeaked through the General Assembly in 1947 because the US threatened to punish vulnerable countries unless they voted ‘yes.’ Driving the majority of the indigenous people off their land, the Zionist settler-state then destroyed about 500 of their villages, after looting houses of everything they contained, furniture, carpets, books and even small household fittings. Even Palestinians who were not driven out but left their homes to get away from the fighting were not allowed to return to them. Those physically expelled were classified as ‘absentees’, those who stayed but still lost their property were classified as ‘present absentees.’ The word absentee implies temporary absence, like a student not turning up for class, but Israel never intended the Palestinians to return. These verbal convolutions were absurdities designed to hide theft on a grand scale. The expulsion of the Palestinian population was not the consequence of war. Rather, it was the other way around: the war was launched so they could be expelled. Their property was handed over to European migrants, with the exception of the beautiful stone homes in Jerusalem and elsewhere stolen by the Zionist leadership for their own use. Despite the destruction, theft, and pillage the UN voted to admit Israel as a member, on condition that it abided by its charter and principles. This Israel has never done. On the contrary, it has lived in permanent breach of the UN charter and the UN’s resolutions on the Palestine question as well as all international covenants and treaties dealing with human and civil rights. Many states breach international law from time to time. Only Israel lives outside the law permanently, for the simple reason that living within the law would bring its existence as a Jewish state to an end. Zionism cannot be reconciled with international law, human rights and democracy any more than fascism or national socialism or South African apartheid could have been. Hitler and Mussolini were at least open in their contempt for liberal democracies: Netanyahu, on the other hand, constantly talks up his respect for democratic values while treating them with the same contempt in practice as the dictators. He is not a democrat. He is a Zionist and as long as expelled Palestinians are prevented from returning to their land and exercising their democratic rights Israel cannot be called a democracy. It should be added that their return would be genuine compared to the false ‘right’ of return granted to Jews around the world who have never lived in Palestine and have no living connection with the land past or present. Insofar as the Palestinians are concerned Israel has changed only for the worse. The state is committed to an ideology that is tribal, atavistic, primitive and criminal of its very nature. It has no place in a world of nation-states committed to universal values, however patchily they might be upheld. Israel assigns Palestine to the Jewish people only, wherever they live; it treats those with a real claim to the land with a ruthlessness and brutality that shocks the world, even if the world is too feeble to do anything about it; it refuses to take any responsibility for the crimes it commits. Zionist ideology is upheld and enforced at every level of government, giving rise to distorted pseudo-laws and deeply rooted racism even amongst children. After seven decades of unremitting violence and attempts to split the Arab world apart and consign Arab history to history, Israel seems beyond redemption and beyond hope that it will change for the better. The ‘peace process’ has come and gone, destroyed by Israel because it never wanted a genuine peace in the first place. What it wants is a ‘peace’ entirely on its own terms, surrender, in other words. Hitler wanted peace, too, as long as he got what he wanted, slabs of Czechoslovakia and Poland without anyone objecting. Those who appeased him were simply feeding his appetite for more and when they finally stood firm, it was too late. Israel revels in its power. It has a large military, it has the US in its pocket, it has nuclear weapons so what could possibly go wrong? It can do what it likes, from massacring scores of Palestinians along the Gaza fence just in one day, to killing Iranians and Syrians in missile strikes and murdering Palestinians in foreign countries who are deemed to be a threat. It gets away with all of this, and, encouraged by the quiescence of the ‘international community’, sees no reason to modify its abominable behavior. The spectacle of the US embassy being opened in Al Quds, an occupied city under international law, was a freak show. As the celebrations of Israel’s ‘independence’ and the relocation of the US embassy continued through the day, Palestinians were being slaughtered on the other side of the Gaza fence line. No-one cared, not Netanyahu, not Ivanka Trump and not her father back in Washington, breaking international law by recognizing an occupied city as the capital of Israel. The champagne flowed. Trump received the accolades of a latter-day Balfour. Ivanka smiled her dolly bird smile while her husband Jared talked of how the embassy opening was going to help the cause of peace. The killing of unarmed Palestinians, including children, by Israeli snipers could not be allowed to spoil the party. 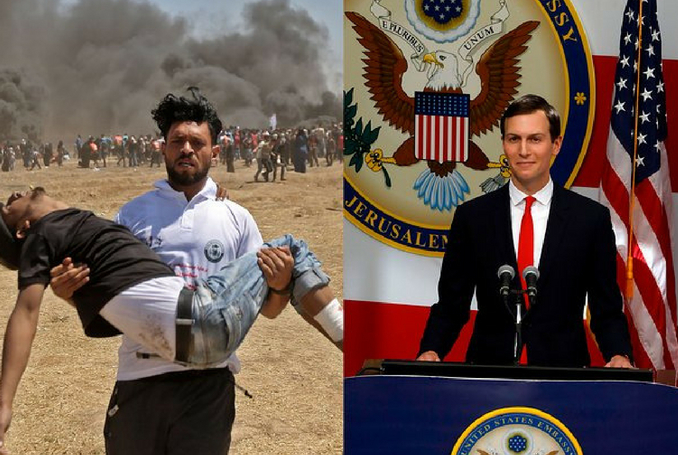 In any case, Jared blamed them: it was they who were responsible for the violence, not the snipers killing them and not the state that stole their land and drove them off it. It was grotesque. The day’s slaughter was not exceptional, not an aberration but fully consistent with Israel’s savage behavior ever since 1948. The delusion of Jerusalem being a Jewish city is a thin mask pulled over the reality. Al Quds is an occupied Palestinian city, open to Muslims, Christians, and Jews until the Crusaders came along in the 11th century and until the Zionists set foot in Palestine in the 20th. Every stone in its streets, arches, walls and fine houses was put in place over the past 1000 years and beyond by Muslim and Christian artisans, not by Jews and certainly not by the Zionists living in stolen Palestinian property and on stolen Palestinian land. There is not a great deal more that can be said about Israel that has not already been said. It has brought nothing to the Middle East but violence and destruction, directed against Palestinians, Lebanese, Jordanians, Syrians, Iraqis, Egyptians, Tunisians, anyone who dares to challenge it. It is a state based on theft and murder. Its ruling ideology is little different from other racist ideologies, of Nazi Germany or apartheid South Africa. It destroys endlessly yet endlessly claims its own ‘right’ to exist. The Middle East has been pushed beyond all limits of human endurance by this psychopathic state. Norman Finkelstein once remarked that for Israel to change it would have to suffer a military defeat to bring it to its senses, but what it might find if that day comes is that what it could have had for nothing the day before, it will not be able to get at any price the day after. Sixty-one Palestinians have now been killed by Israeli occupation forces as a result of yesterday’s protests in the besieged Gaza Strip. The protests, which took place against the US’ inauguration of its embassy in occupied Jerusalem and the 70th anniversary of the Nakba, continued today and have been met with relentless Israeli aggression as dozens of Palestinians have been killed and hundreds more injured. The assault also claimed the life of eight-month-old Layla Al-Ghandoor who died this morning of tear gas inhalation fired by Israeli forces yesterday, making her the youngest victim of Israeli violence. In the West Bank, Israeli forces responded with brutal violence to protests this morning, as unarmed demonstrators faced live fire. 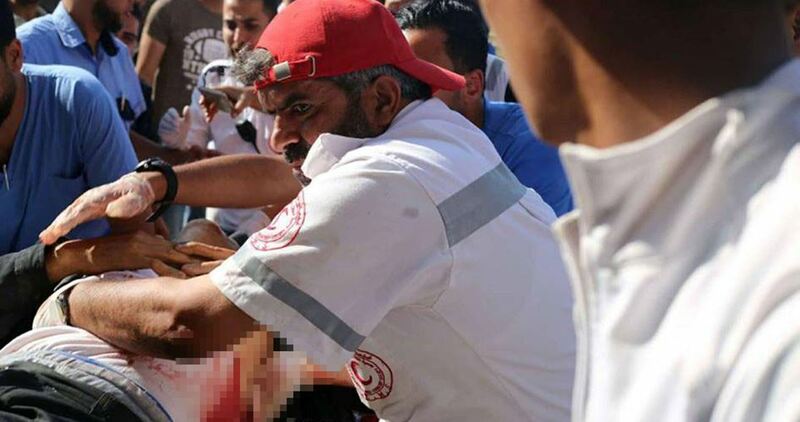 According to the Palestinian Red Crescent, at least 46 people have been injured by gunfire in Bethlehem. In Al-Bireh, Israeli forces fired live ammunition at Palestinian youth, with gas bombs dropped to disperse crowds. 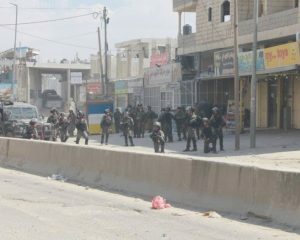 Protests in Beit El have also been met with tear gas forcing peaceful demonstrators and paramedics to retreat. In Jerusalem, tightened security around the Al-Aqsa Mosque compound has led to Palestinians being forced to endure security checks upon entering the Old City via Damascus Gate as well as an increased military presence. There were fewer protestors today as the organising committee called for a day of mourning after yesterday saw the largest number of casualties in a single day in Gaza since the 2014 Israeli attack on the besieged Strip. Thousands of Palestinians participated in funeral processions across the Gaza Strip; reports stated that there were funerals taking place on every street. Health services in Gaza already suffering from a lack of equipment and essential medicines are struggling to cope with the high level of casualties. Yesterday there were calls for donations of O negative type blood amidst the high number of injuries. Jordan and the PA have responded to the crisis offering to send medical supplies and a medical team. Turkey and South Africa have recalled their ambassadors from Tel Aviv in condemnation of the brutalities committed by Israeli forces against Palestinian protestors while the UN Security Council is holding an emergency session to discuss the developments on the ground.